With the Sunday Telegraph seemingly unable to tell the difference between a Friday, Tuesday and a Sunday, having variously seen the Booker column published on all of these days (when the usual publication is late Saturday), we're back to the now usual chaotic performance of the paper. Gone midnight, and into the early hours of Sunday (at the time of writing), there is no sign of the column. In fact, when we last looked at the author page, Booker's work had been "disappeared", with the chronological list of columns left worryingly blank. The details had been wiped from the public record. That leaves me, as I so often find myself doing these days, preempting the official on-line publication with a rendition of my own, based on Booker's copy. And this week, I have a difficult task of weaving in his theme with an unlikely partner – details of how they are preparing for a no-deal scenario in Holland. Turning to Booker first, he opens his column with the assertion that: "There was no more symbolic measure more of the ever dismal unreality into which Brexit descended last week than those opposition leaders calling on Theresa May to ensure that we do not leave the EU without a 'deal'". "Although they have belatedly realised that doing so would inflict catastrophic damage on our economy", he says, "not one seemed to recognise that it was their own resounding rejection of the only deal on offer that appears to have made this catastrophe virtually inevitable". But the shambles we have made of Brexit is only the most conspicuous symptom of a far wider malaise which in recent years has come to infect almost every area of our public life. Whenever I hear the complaint that Britain is in a tragic state of decline, I have long replied that "there are still a great many good people in this country. The trouble is that none of them are running it". … what has happened to our police, as knife crime and drug addiction rage unabated, or the unruly state of our prisons, or our emasculated Armed Forces, or our chaotic railways, or our semi-bankrupt local government with senior officials paid more than the prime minister, or our rubbish collection, or our legal system (and in particular our horribly corrupted and dehumanised system of “child protection”). Think of the perpetual air of crisis hanging over the NHS, or our benefits system, or what has happened to too many schools and universities, or our suicidal national energy policy, let alone the weirdly self-regarding transformation which has come over the once-respected BBC. Everywhere the story is similar. In each case there are still plenty of capable people trying to work by values and standards no longer fashionable: struggling with the dead hand of groupthink and political correctness; while those in charge, having lost all touch with reality, fritter away their time and our money on endless bureaucratic displacement activity and crazily make-believe schemes like HS2. The truth is that we have seen a system of government once admired across the world in ever accelerating decline, as our fractious rabble of politicians have come to be held in ever greater contempt. One reason for this has been the extent to which we have outsourced so much of our government to that other form of government centred in Brussels, which we are now making such a mess of our attempt to leave. But how ironic that nothing has more acutely raised the question of whether in fact we are any longer capable of governing ourselves. This is a difficult and contentious point to make, as there seems to be something peculiarly British in this phenomenon, where the attenuation of our decision-making powers has had such an impact on the general performance of government, to the extent that we are seeing such obvious deterioration. As an out-of-left-field theory, this may have something to do with the UK not in recent history having been conquered and occupied by a foreign power. Thus it has had no experience of administering a nation under the supervision of a remote, higher government that does not have its interests at heart. Anyway, we need to treat that as a throw-away observation and bring in the Dutch situation with the separate observation that, whatever might be the situation in the UK, the Dutch do not seem entirely to have lost the capacity for self-government – at least, when it comes to preparations for a no-deal Brexit. While Mrs May seems to be all over the place, with MPs and the media reflecting the utter confusion at the heart of government, on Friday the Dutch Minister of Foreign Affairs sent a sombre letter to colleagues in Parliament enclosing a 16-page overview of the state of preparedness for dealing with a no-deal Brexit. Here, immediately, we see the startling contrast. While the Westminster parliament is getting bogged down in more and more convoluted plots and stratagems, the Dutch are quietly getting on with the detailed work of getting ready for what they now regard as inevitable. 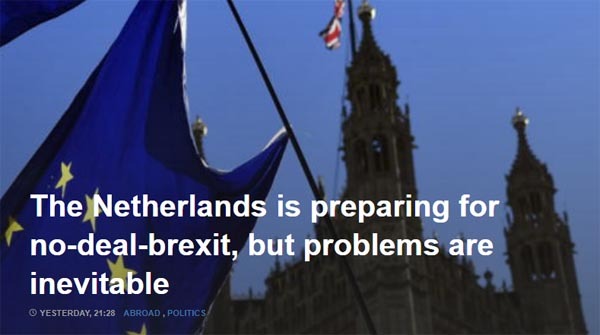 Picked up by Nederlandse Omroep Stichting (NOS), the Dutch Broadcast Foundation, its report blandly advised that The Netherlands was preparing for a no-deal Brexit, "but problems are inevitable". Not least of those problems is the provision of extra customs officers. Altogether, it is estimated that 928 new officials will be needed to carry out the border controls which will be applied to the UK as a third country. But, by 30 March, only 321 will be deployable. It will not be until the end of 2020 that staffing needs will have been met. Although the customs service is planning to phase in enforcement gradually, concentrating on carrying out the checks specifically required by the EU, it is acknowledged that there are bound to be traffic jams and long waiting times. Another particular problem is that Dutch ports are often used as portals for out-of-country shippers. And while the government is going out of its way to inform its own citizens and shippers of the new rules, it has no control over foreign truckers who may turn up without the necessary papers. Here, in a process that might have some lessons for the UK, the government will be expecting the ferry companies to operate a system where they will not accept bookings unless all their papers are in order. However, since a proportion book on arrival, this will not answer all the concerns, and extra delays are likely. For veterinary inspections, at least the Dutch authorities have the basic infrastructure in place, so it is a matter of increasing utilisation, employing more staff and extending hours of operation. As for inspectors, the Foreign Ministry overview notes that, in the worst-case scenario, 143 staff will be required – including about 100 veterinarians - with a third for import controls and two thirds for export certification, the latter being required only if the UK adopts comparable border controls. Training is in full swing and will be completed before 29 March. In addition, non-Dutch-speaking veterinarians are being recruited and trained for export certification. The first tranche of twenty-three is currently undergoing training before March 29th. A second tranche of 36 non-Dutch-speaking veterinarians is currently being recruited and will start with language training in April 2019. Recruitment will then continue until the required number of employees has been achieved. The other agricultural inspection services are also preparing for Brexit. For example, the Quality Control Bureau (KCB) has now hired 15 of the 33 extra inspectors and trained them on time. Naktuinbouw (Inspection Service for Horticulture) has four out of 12 additional inspectors and the Central Agency for Dairy Quality has two of the extra three people it needs. The detail here is useful as it indicates how advanced the planning is, and contrasts sharply with the minimal information we're getting from the French government, which is only now recruiting an unspecified number of veterinarians. Even then, the Dutch still have problems. Apart from Schiphol and Maastricht Aachen airports, there are no Border Inspection Posts for live animals. In a no-deal scenario, therefore, there can be no import of live animals to the Netherlands via a seaport – underlining the fact that, unless the right facilities exist, there can be no imports. As a helpful reminder, the Foreign Ministry points out that it is the business community which is responsible for the construction and design of inspection posts – and for financing the buildings and equipment. This is another indicator of how problematical it is going to be, to get all the new provisions in place. In what will be bad news for British transport operators, though, the Dutch government notes that, in a no-deal scenario, reciprocal access to each other's market in road transport will lapse as regulated in Regulation 1072/2009. In a draft law which has already been passed by the lower house, the Dutch Road Traffic Act will be amended, removing recognition of driving licenses, certificates of professional competence and other transport-related certificates. Aviation is largely covered by temporary provisions proposed by the Commission, although there is another complication. The legal basis of the agreements on a piece of Dutch airspace over the North Sea - where air traffic management by UK air traffic control has been implemented - is no longer applicable. This, says the Foreign Ministry, may cause a disruption in a part of the Dutch airspace, with possible consequences for safety and capacity. In a further report on customs preparations for Brexit, published in November last year - and see also this - we see still further details, the latter confirming that, "Customs will not be completely prepared for the additional volume of work that it will have to carry out after a cliff edge Brexit". These reports outline the degree of planning that has been undertaken, with far more transparency than we've seen from the UK government. And still, as one might expect, the Dutch government is admitting that they won't be ready for a no-deal Brexit. By contrast, the complete inability of the UK government and the media to focus on this issue, and the obsession of the media and parliamentarians for the Brexit soap opera, sends its own message. While the Dutch are talking tomatoes and the complications of exporting them in a post-Brexit world, the UK politicians are focused on plots. But, if the shops start to empty, they will learn anew that plots don't fill bellies – by which time it might be too late to re-learn the art of self-governance.